Explore the full diversity of film experiences – in print and in video. The experience of watching films can begin with journeying to imaginary worlds, witnessing re-creations of history, observing stars in familiar and unfamiliar roles, and exploring the laughter, thrills, or emotions of different genres. Understanding the full depth and variety of these experiences starts with that enjoyment. But it also requires knowledge of the technology, business, history, and visual language of cinema. 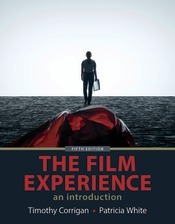 The Film Experience brings all of this together in one comprehensive book. The Film Experience: An Introduction aims to help students learn these film languages and synthesize them into a cohesive understanding of the medium that will, in turn, enhance their own film experiences. The new edition places special emphasis on representation throughout the history of film, highlighting voices and groups from the past that interact with the medium’s future. More than ever, the book places important historical developments in the modern, accessible context of ever-changing film technology, economics, and narrative. Throughout the book (and online through its LaunchPad Solo), perfect examples and digital tools bring this material to life.